Dell XPS 13 portable laptops have finally got a complete makeover after bearing almost the same design for about three years. Among the major changes included are a revamped chassis, 8th-Gen Intel CPU and improved battery life. Further, Dell also offers a new rose gold and white color variant to the customers. 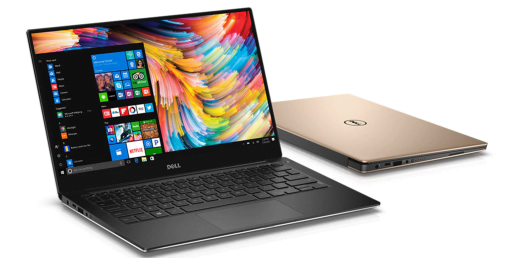 While a superficial look would not give much clarity to the changes that Dell has made, a closer analysis reveals a slew of new features and specifications. The Dell XPS 13 is thinner and lighter than its predecessor. Further, Dell also claims that the revamped machine is 24% smaller by volume compared to its predecessors. The 2017 version of XPS 13 was the world’s smallest 13.3-inch laptop, and now the title goes to the new variant. Dell XPS 13 almost matches the dimensions of Apple’s 12-inch MacBook, according to Gizmodo. Dell’s machine measures 11.97 x 7.8 x 0.46 inches and weighs 2.68 pounds compared to the Mac at 11.04 x 7.74 x 0.52 inches and 2.03 pounds. Apple’s 13-inch MacBook Air is 12.8 x 8.94 x 0.68 inches and 2.96 pounds. Buyers have the option to select from the 4K UHD-or full HD resolution touch display, or a full HD non-touch display. Dell notes that the issue of color shifting at the maximum brightness, which occurred in the previous versions, has also been resolved. As a result, the 4K UHD version will have 100% sRGB color gamut at 400 nits, according to CNET. Dell claims that it doubled up on the heat pipes and fans along with a higher Gore Thermal Insulation, which directs the heat straight out of the device instead of into the laptop chassis. These cooling tweaks would increase the performance of the components while cutting down on the heat, according to CNET. Dell stated that its benchmark results show XPS 13’s operating for approximately 20 hours with a full-HD display, and around 11 hours with a 4k display. While the inclusion of two Thunderbolts 3 ports along with a USB port is thrilling, Dell has done away with the universal USB Type-A to “save space.” There is also a 45-watt USB-C charger along with a micro SD card reader and a lock port. Along with the specifications, Dell has worked hard on the look of the laptop as well. The company claims that the new rose gold and white offerings are not merely paint. According to the company, the white color is a blend of nine layers of crystalline Silica glass fiber. Dell is aware that the white variant is prone to get dirty by frequent use. Therefore, the company has made sure that it can be cleaned easily, including wiping off stains as rigid as marker and mustard, notes The Verge. Dell has kept the location of the webcam (now infrared camera) unchanged at the bottom, but a little more centered. Further, users would be able to enter the machine through facial recognition or the fingerprint reader built into the power button. The Dell XPS 13 is now available for sale and pricing starts at $999. The company is also offering a developer edition of the laptop running Linux for $50 less.